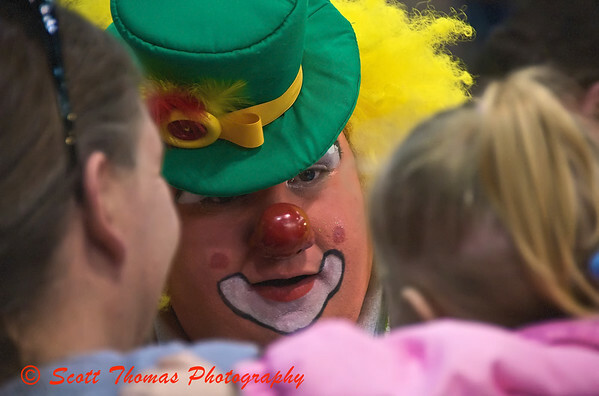 A Clown makes a friend at the Tigris Shrine Circus at the NYS Fairground's Coliseum near Syracuse, New York on Sunday, April 5, 2009. This entry was posted in People, Weekly View and tagged children, circus, clown, fun, kids, mom, mother, new york, Photography, syracuse, tigris shrine. Bookmark the permalink. I did get some clown portraits but this one showed the heart of this clown. I agree he doesn’t look to scary at all, I used to be terrified of clowns as a child, very nice shot Scott !! Colorful and interesting, however clowns do tend to creep me out. Nice shot of the clown. Great moment of interaction. Great use of DOF to make an eye catching shot. I was immediately drawn to the clown’s left eye. There I found a gentle warmth that made this image of a clown’s hug believable. Nice work as always.